For the first time, the Chandi Path is available to a Western audience, complete with English translation, Roman transliteration, as well as the original Sanskrit. The Chandi Path is one of the most ancient and complete systems of mantra worship of the Divine Mother Goddess in the Hindu tradition. The Chandi Path comes from chapters 81 to 93 of the Markandeya Purana, one of the greatest spiritual treasures of Hindu spirituality. It is a universal epic which tells the story of how the Businessman and the King discover the Glory of the Goddess. 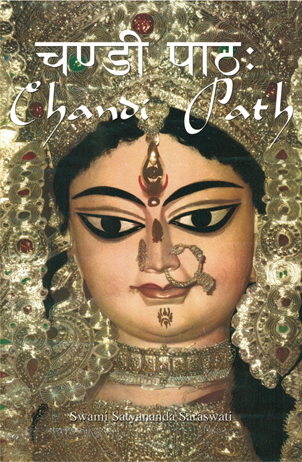 “Thank you so much for the Chandi Path and it’s beautiful translation. There are no words with which I can express my gratitude. Chanting the Chandi Path has taken me straight to Devi’s feet where she constantly showers motherly love and grace. I have never felt more looked after and loved. Chandi has given me immense devotion, true freedom, and absolute trust that has enhanced the quality of my life and my relationships. “Thank you Swamiji for your wonderful translation of the Chandi Path and for the online video class that teaches the deepest meanings and purpose of this sacred scripture. “Thank so much for your books. I’m not sure I’ve ever experienced anything as vividly rewarding in my life as trying to recite the Chandi book. Life is increasingly Profound!